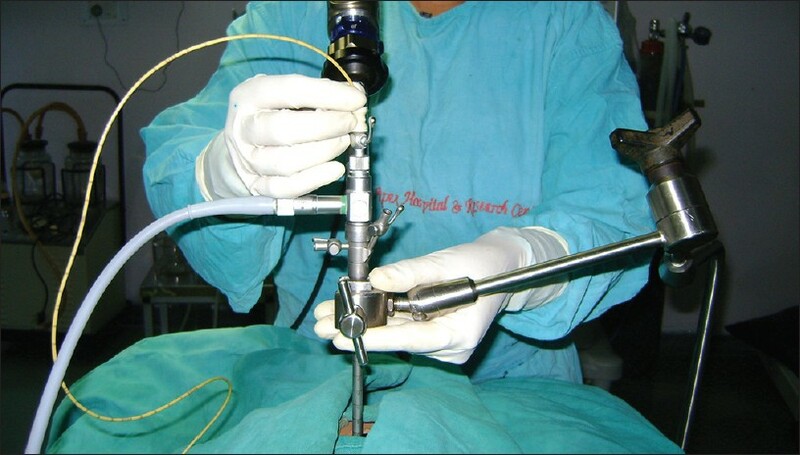 Endoscopic techniques are increasingly being used in recent times for various spinal and brain pathologies. Although endoscopic neurosurgical technique holds the potential for reducing morbidity, it is also associated with limitations such as steep learning curve, obstruction in manipulation of instruments by telescope in an already limited exposure, proximal blind spot, visual obscuration, disorientation, loss of stereoscopic image and others. Neuroendoscopy is distinct from micro-surgery and a thorough understanding of the technique and its limitations is required to get maximal benefit. Difficulties in controlling bleeding, longer operative time are common obstacles with this technique, especially in early learning curve. Higher complication rate during initial learning curve can be reduced by attending live workshops, practice on models and hands on cadaveric workshops. Large vascular lesions should be avoided and a thorough knowledge of possible complications and techniques to avoid such complications can improve results in endoscopic surgery. Background: Gluten sensitivity (GS) is a spectrum of disorders with diverse manifestations. Recent evidence suggests that ataxia may be the only manifestation of GS and that it may be one of the causes of sporadic ataxia. Aim: To investigate the prevalence of gluten ataxia among patients with ataxia in China. Materials and Methods: Serum levels of anti-gliadin, anti-transglutaminase 2 (TG2), and anti-transglutaminase 6 (TG6) antibodies measured in 125 patients with ataxia (100 patients with sporadic ataxia and 25 patients with hereditary ataxia) and 51 healthy controls by enzyme-linked immunosorbent assay (ELISA). Results: The serum concentrations of anti-gliadin, anti-TG2 IgG, IgA, and TG6-IgG antibodies were elevated in ataxia patients, but the increase was not statistically significant. 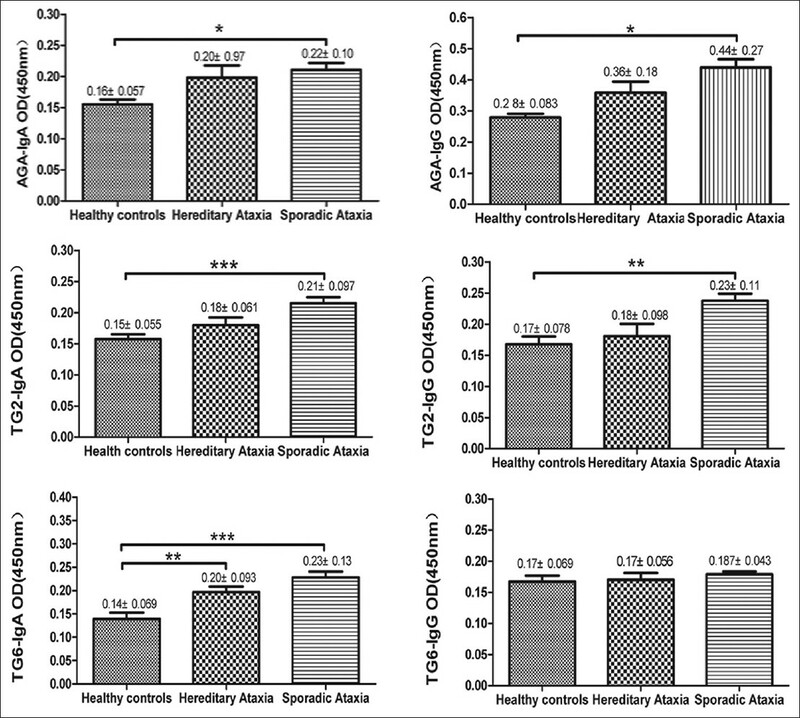 However, TG6-IgA serum levels were significantly higher in sporadic ataxia as compared to those in healthy controls (P < 0.05). Conclusions: These results provide evidence that sporadic ataxia in a subgroup of patients may be due to gluten ataxia in mainland China. Measurement of serum anti-TG6 antibodies along with anti-TG2 and anti-gliadin antibodies may be useful for diagnosing gluten ataxia. Background: Numerous studies have investigated the associations of brain or spinal cord MRI with the risk of developing Multiple Sclerosis (MS) in people with Clinically Isolated Syndrome (CIS), however, the findings are uncertain. 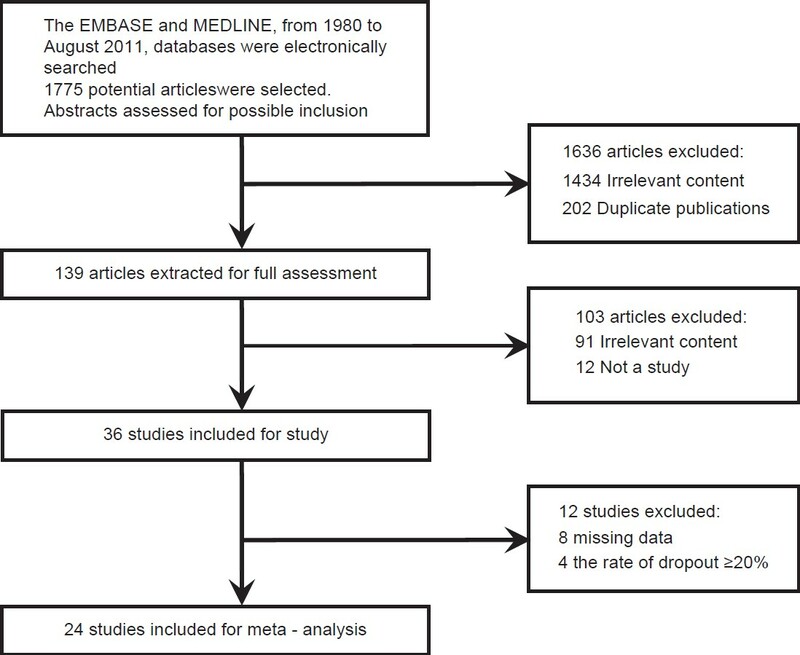 Therefore, we performed a meta-analysis based on 24 publications to comprehensively evaluate such associations. Materials and Methods: The databases of EMBASE and MEDLINE (January 1980-August 2011) were searched electronically for all relevant studies. Data were extracted from each study independently by both reviewers using a predefined structured spreadsheet. The quality of each study was assessed independently by two reviewers according to Newcastle-Ottawa Scale for reading cohort study proposed by Deeks et al. The meta-analysis including 24 qualified studies was performed by using the Cochrane Collaborations RevMan5.0 software. Results: Twenty-four identified studies met the inclusion criteria and minimum quality threshold. A meta-analysis of cohort studies indicated that the CISs having MRI lesions did have significantly increased risk for MS (risk ratio [RR] = 3.71, 95% confidence interval [CI], 3.27-4.21, P < 0.00001). In the subgroup analysis (according to the number of T2 lesions at baseline), the risk of developing MS in CIS patients with the medium MRI burden (4-9 lesions) was higher than with the low MRI burden (1-3 lesions) (RR = 0.66,95% CI, 0.45-0.95, P < 0.00001). 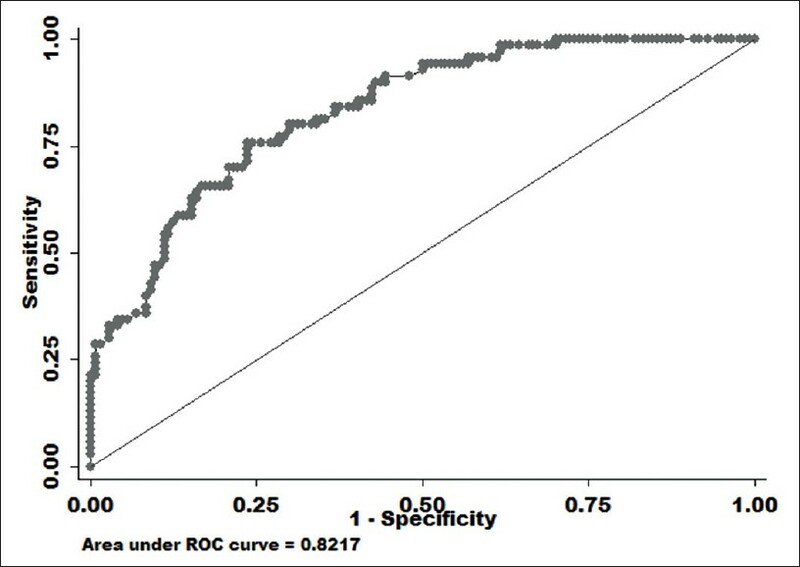 While, no correlation was found in group between the medium MRI burden and the high MRI burden(>9 lesions) (RR = 0.97, 95% CI, 0.82-1.15, P = 0.72). 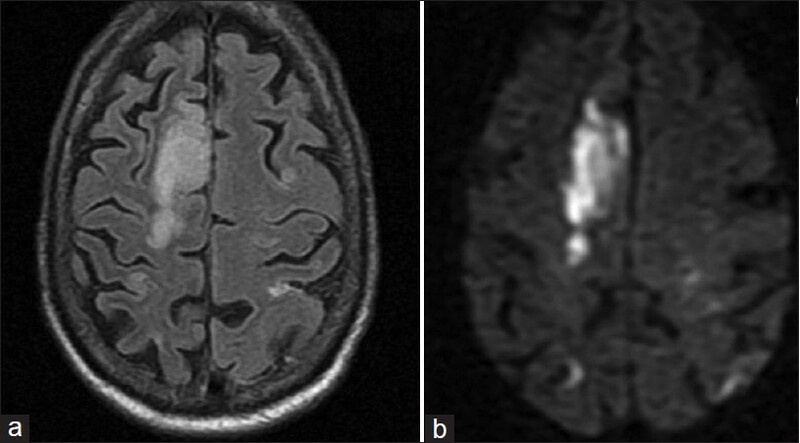 Meanwhile, the CIS patients with abnormal baseline MRI, especially with infratentorial lesions, had a high risk of conversion to MS compared to patients without the such infratentorial lesions (RR = 1.37, % CI, 1.09-1.73, P = 0.0008). Conclusions: Despite some limitations, this meta-analysis established solid statistical evidence for an association between the presence or absence of MRI lesions within the brain or spinal cord MRI and the risk of developing MS, particularly for studies with large sample size. 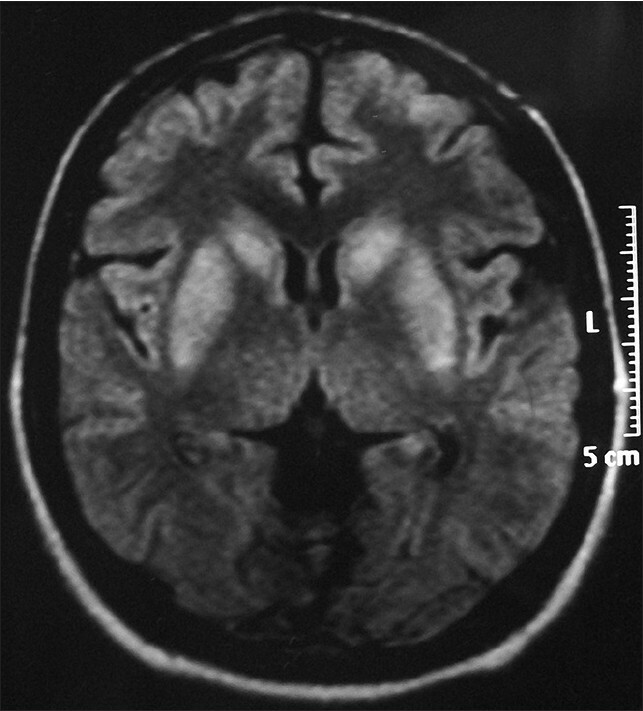 The CIS patients with abnormal baseline MRI, especially with infratentorial lesions, had a high risk of conversion to MS. However, this association warrants additional validation in larger and well designed studies. Context: Syncope is a common cause of transient loss of consciousness. In the analysis of patients having syncope, body position has not been systematically studied and correlated with triggers, prodromal symptoms and circumstances. This correlation is important in differentiating syncope from its mimics. Aims: To study syncope with respect to body positions, triggers, prodromal symptoms and circumstances. 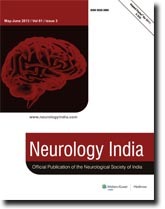 Settings and Design: Prospective study set in Neurology Department of Tertiary Care Center. Materials and Methods: Patients fulfilling guidelines set by The Task Force for the Diagnosis and Management of Syncope of the European Society of Cardiology (ESC) were recruited. Detailed clinical history, examination and investigations (ECG, 2D-ECHO, Head Up Tilt Test, Holter monitor, EEG, MRI Brain) were carried out. Results: Out of the 111 recruited patients, 67 developed syncope in standing, 16 in sitting, 23 in both standing and sitting, 1 in both sitting and supine and 4 in all three positions. Prodromal symptoms were present in 81% while triggers in 42% and circumstances in 41% of patients. Black out, sweating, dizziness and headache were most common prodromal symptoms. Intense pain, smell and fear were most common triggers while prolonged standing, hot crowded room and fasting were most common circumstances associated with syncope. Conclusions: Against common belief, syncope can occur in sitting as well as in supine position. 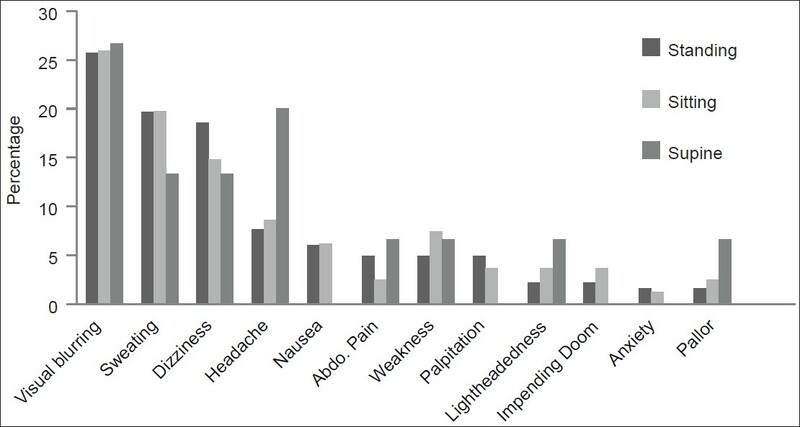 Emotional triggers were commoner in patients with syncope in supine and sitting positions while prodromal symptoms and circumstances were similar for all positions. Syncope should be considered in body positions other than standing. Background: Intracerebral hemorrhage (ICH) is associated with high mortality and morbidity. Various clinical and imaging predictors of mortality have been observed in previous studies. Aims: To study factors associated with in-hospital mortality in patients with ICH and observe the disability status of patients [assessed by modified Rankin scale (mRS)] at the time of discharge. Design: Prospective observational study. Materials and Methods: All consecutive patients with acute hypertensive ICH admitted during the study period were enrolled. Data recorded included: Demographics, clinical, biochemical and cranial computed tomography (CT) findings. Primary outcome was defined as either death or survival within the hospital. mRS was used to assess outcome at discharge. Results: Of the total 214 patients with ICH (193 supratentorial and 21 infratentorial), 70 (32.7%) patients died during the hospital stay. On bivariate analysis, low Glasgow Coma Scale (GCS) score, ventilatory assistance, higher hematoma volume, midline shift, hydrocephalus and intraventricular hematoma (IVH) were associated with mortality. ICH grading scale (ICH-GS) and ICH scores were higher in patients who died (P < 0.0001). Ninety-five (44.6%) patients underwent a neurosurgical intervention; 66 (45.8%) patients among the survivors compared with 29 (41.4%) among those who died (P = 0.54, Odds Ratio (OR) 0.83, 95% Confidence Interval (CI) 0.46-1.48). 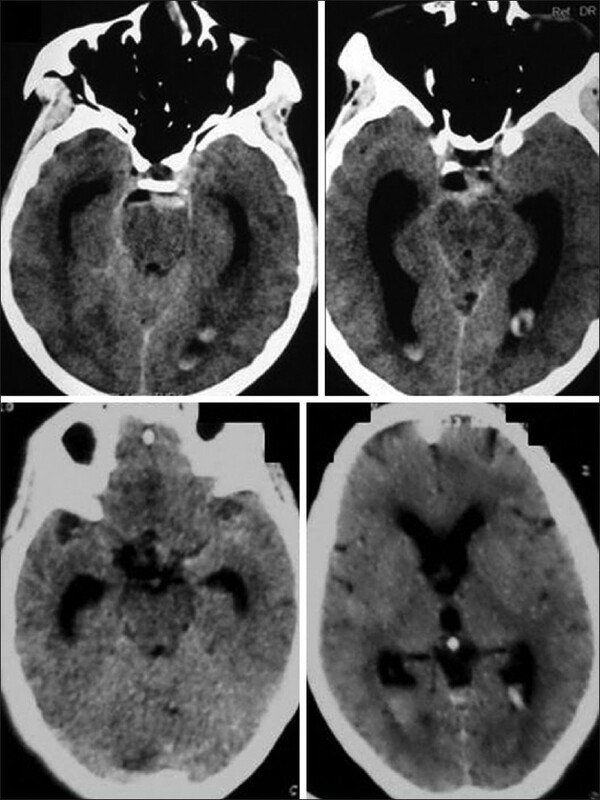 Independent predictors of mortality included a higher baseline hematoma volume ( P = 0.04 OR 1.01, 95% CI 1.00-1.02), lower GCS ( P = 0.01 OR 2.57, 95%CI 1.25-5.29), intraventricular extension of hematoma ( P = 0.007 OR 2.66, 95% CI 1.26-5.56) and ventilatory requirement (P < 0.0001 OR 8.34, 95%CI 2.75-25.38). Among survivors (n = 144), most were disabled [mRS 0-3, 7 (4.8%) and mRS 4-5, 137 (95.13%)] at discharge. Conclusions: Low GCS, higher baseline ICH volume, presence of IVH and need for ventilatory assistance are independent predictors of mortality. Most of the patients at discharge were disabled. Surgery did not improve mortality or outcome. Background: Adiponectin is a hormone secreted exclusively by adipose tissue, and is important in the regulation of tissue inflammation and insulin sensitivity. Adiponectin exerts its effects through two cell-surface receptors: Adiponectin receptor 1 (ADR1) and ADR2. However, the relationship between ADR1/2 expression and progression of atherosclerosis or plaque vulnerability remains unclear. Aims: To investigate the relationship between ADR1/2 expression and plaque characteristics in patients with carotid artery atherosclerosis. Materials and Methods: Forty-three patients who underwent carotid endarterectomy for treatment of carotid artery stenosis were reviewed. Immunohistochemical staining for ADR1 and ADR2 was performed in the specimens of carotid plaque. The relationships between ADR1/2 expression and clinical characteristics were analyzed statistically. Results: Plaque was stable in 7 patients and vulnerable in 36 patients. ADR1 expression was considered weak in 29 patients and strong in 14 patients. The formation of vulnerable plaques was significantly correlated with weak ADR1 expression (P < 0.003). ADR2 expression was considered weak in 14 patients and strong in 29 patients. Rates of formation of vulnerable plaque did not differ between patients with weak and strong ADR2 expression. Conclusions: Based on previous and the present results, ADR1 may be strongly related to the stabilization of established atherosclerotic plaques via inactivating macrophages. Enhancement of ADR1 expression could serve as a therapeutic target for the prevention of the formation of vulnerable plaque. 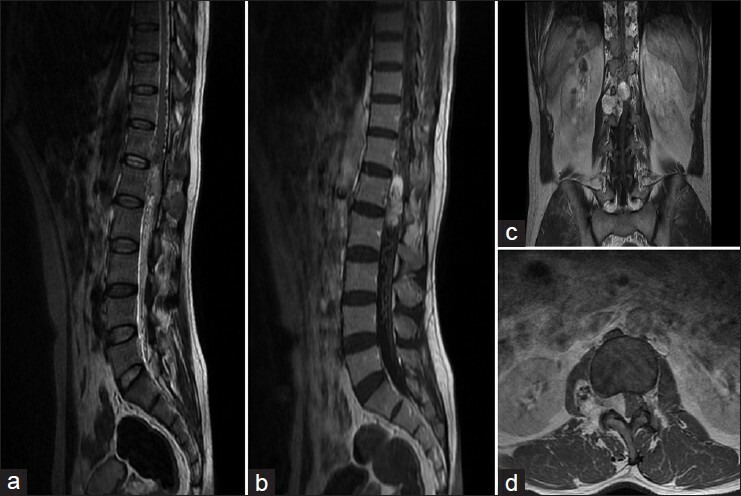 Background: Congenital myopathies (CMs) are rare and they are clinically and genetically heterogeneous. Muscle biopsy is characterized by structural abnormality that is diagnostic. There are few studies from India. Materials and Methods: This is a retrospective study of 12 years. The demographic data, clinical features and laboratory data of patients diagnosed as CMs on muscle biopsy were retrieved from medical records. The slides were reviewed for morphological and structural abnormalities using the following stains hematoxylin and eosin, modified Gomori trichrome, masson trichrome, periodic acid schiff, adenosine triphosphatase preincubated at pH 9.4, 4.6 and 4.3, nicotinamide adenine dinucleotide tetrazolium reductase, succinic dehydrogenase and cytochrome c oxidase. Immunohistochemistry was performed with dystrophin, sarcoglycans and desmin wherever necessary. Results: There were 50 patients with CMs: Centronuclear myopathy (23), myotubular myopathy (3) and central core disease (CCD) (8), nemaline myopathy (5), congenital fiber type proportion (10) and desmin related myopathy with arrythmogenic right ventricular cardiomyopathy (ARVD) (1). Of the 50 patients, 30 (60%) presented in the first decade of life. Proximal muscle weakness and hypotonia were the common presenting features. Type 1 atrophy and predominance were seen in most cases on muscle biopsy. CCD had one patient with high creatine phosphokinase levels, biopsy in one patient showed both rods and cores, in the other limb girdle muscular dystrophy like picture and one biopsy showed uniform type 1 fibers. There was one desmin related myopathy with ARVD, who had cardiac transplantation and both skeletal and cardiac muscle showed characteristic rimmed vacuoles and inclusions positive for desmin. Conclusion: CMs are rare and the diagnosis can only be established on muscle biopsy. Defining the specific CMs helps the clinician in counseling the patient and family. Background: Primary central nervous system lymphoma (PCNSL) is an aggressive extranodal non-Hodgkin's lymphoma limited to the CNS. 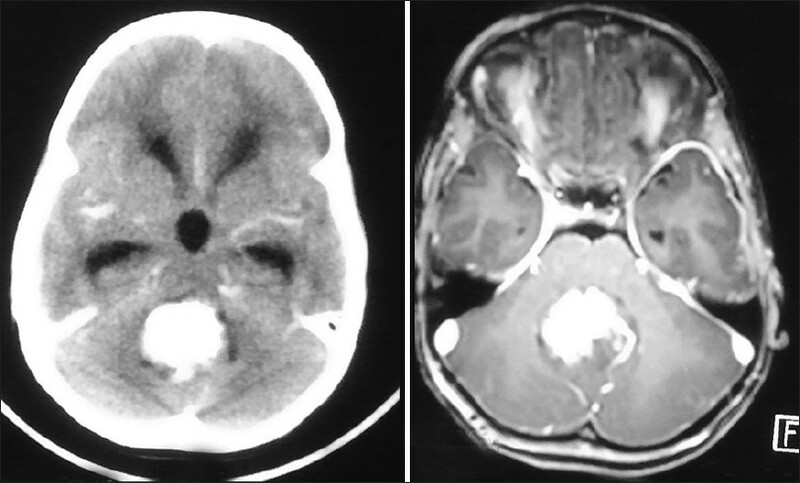 Treatment of PCNSL with high-dose methotrexate (HD-MTX)-based chemotherapy and whole-brain radiotherapy (WBRT) is associated with high rates of relapse and severe treatment-related neurotoxicity. Aim: To report our experience of treating newly diagnosed PCNSL with temozolomide, nedaplatin, and vincristine (TNV), as the replacement of HD-MTX, in combination with concurrent chemoradiotherapy. Materials and Methods: Newly diagnosed PCNSL patients were given concurrent temozolomide (75 mg/m 2 , orally) daily during WBRT. Then, the TNV regimen was given after four weeks. The TNV regimen consisted of temozolomide (200 mg/m 2 orally: Days 1-5), nedaplatin (80 mg/m 2 intravenous: Day 1), and vincristine (1.4 mg/m 2 intravenous: Day 1). Each cycle was of a duration of four weeks and a maximum of six cycles were applied. The primary end point was response to treatment obtained by magnetic resonance imaging (MRI). Secondary end points were progression-free survival (PFS) and fewer toxic effects. Results: The study subjects included 14 patients (median age: 53.5, median Karnofsky Performance Scale (KPS): 75). The median number of TNV cycles given was five. Response to treatment: Complete response in 12 (85.7%) patients, partial response in 2 (14.3%) patients, and none with progressive disease. 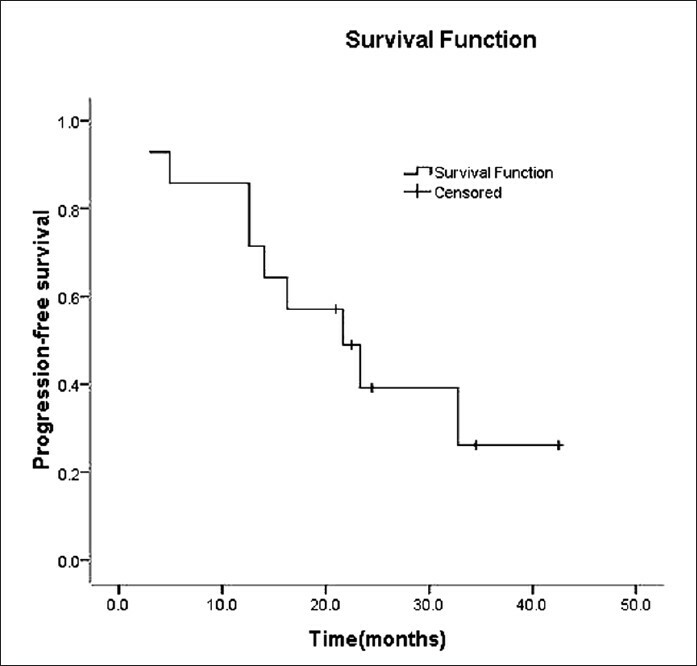 The objective response rate was 100%, and median PFS was 21.4 months. Toxicity was relatively mild, which mainly included nausea in six and fatigue in five, grade 3-4 hematotoxicity in one, and abnormal liver functions in five patients. No neurotoxicity has been observed till date. Conclusion: The efficacy outcomes in this study are comparable to other reported HD-MTX-based regimens plus WBRT, with an added favorable toxicity profile. Prospective, randomized controlled trials are warranted to confirm such results. 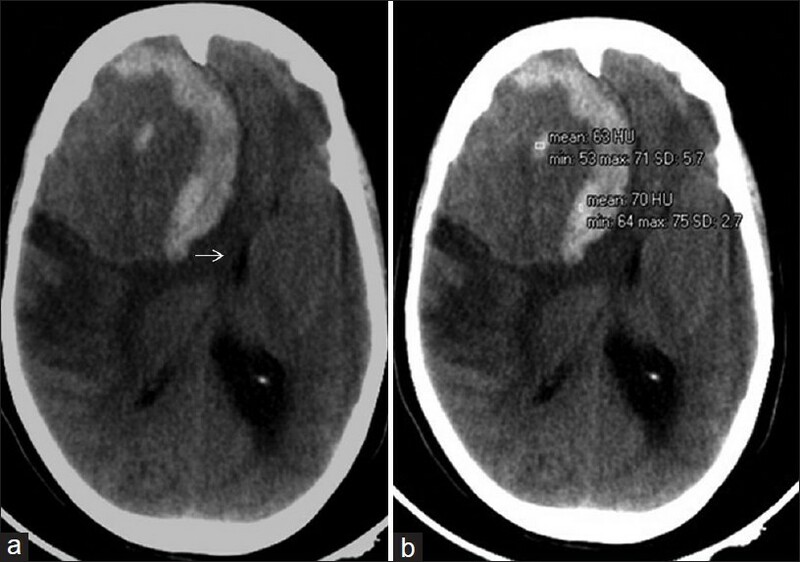 Background: Aneurysms located at distal posterior inferior cerebellar artery (PICA) are rare. These aneurysms are difficult for surgical or endovascular treatment, especially for ruptured aneurysms. Aims: To investigate the clinical and radiologic efficacy of parent artery occlusion (PAO) with embolic agent Onyx in the treatment of distal PICA aneurysm. 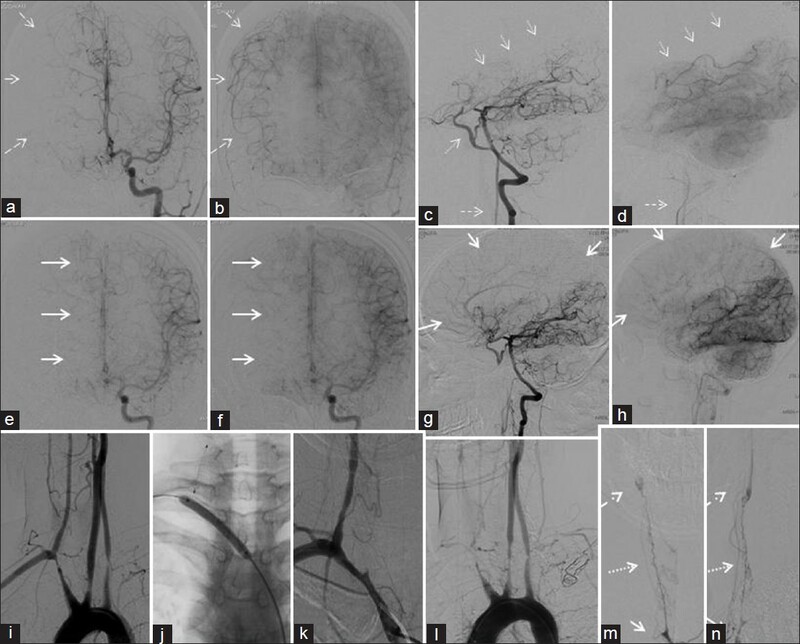 Materials and Methods: Case records of 15 consecutive patients with 15 ruptured distal PICA aneurysms treated with Onyx embolization were reviewed retrospectively. The follow-up ranged between 6 and 52 months. 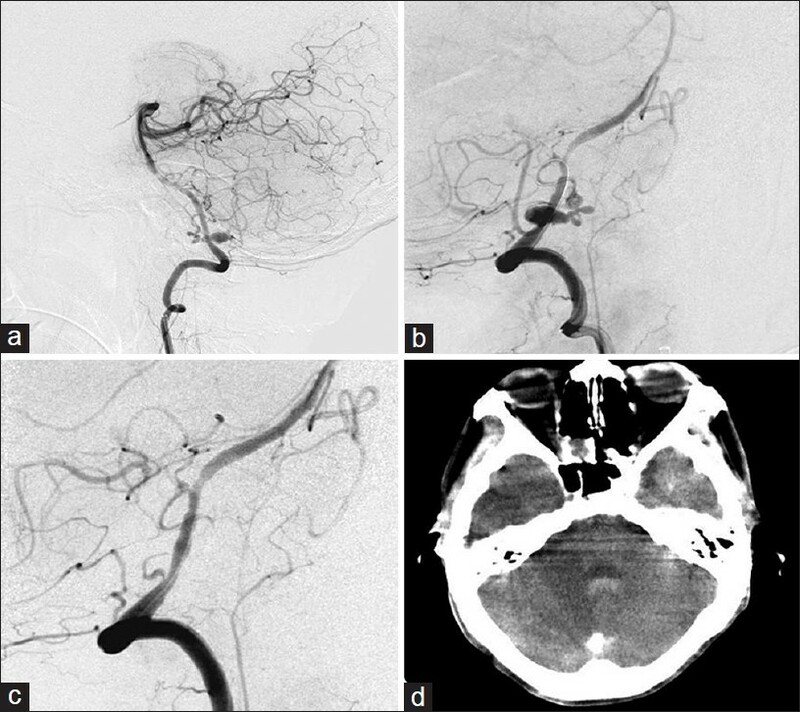 Cerebral angiography or cerebra computed tomography-angiogram (CTA) was performed for follow-up radiological study. 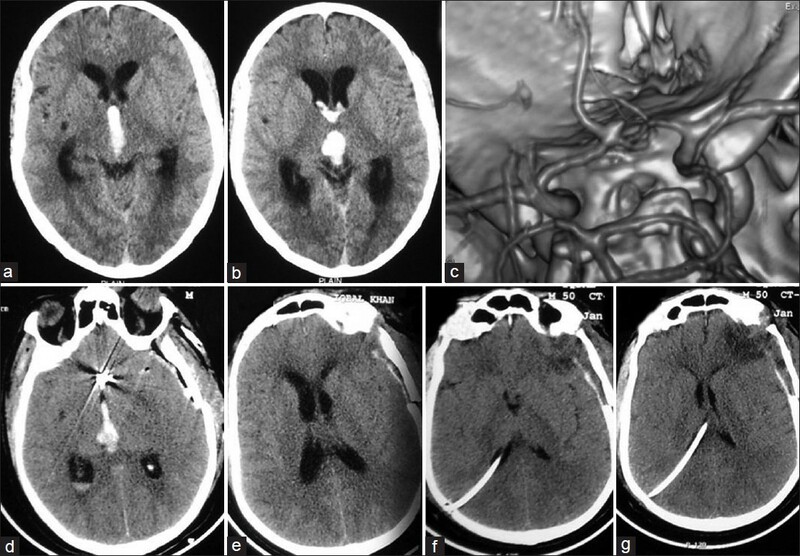 Two aneurysms had origin from tonsillomedullary segment, nine from telovelotonsillar segments, and four from cortical segments. All patients were treated with Onyx to occlude aneurysm and proximal portion of vessel in front of aneurysm via endovascular approach. Results: Aneurysm was occluded completely in every patient. One patient died because of intra-procedure haemorrhage. Fourteen patients had good recovery and the last follow-up Glasgow outcome scale was 5. Head CT scan was performed in every survived patient before discharge. 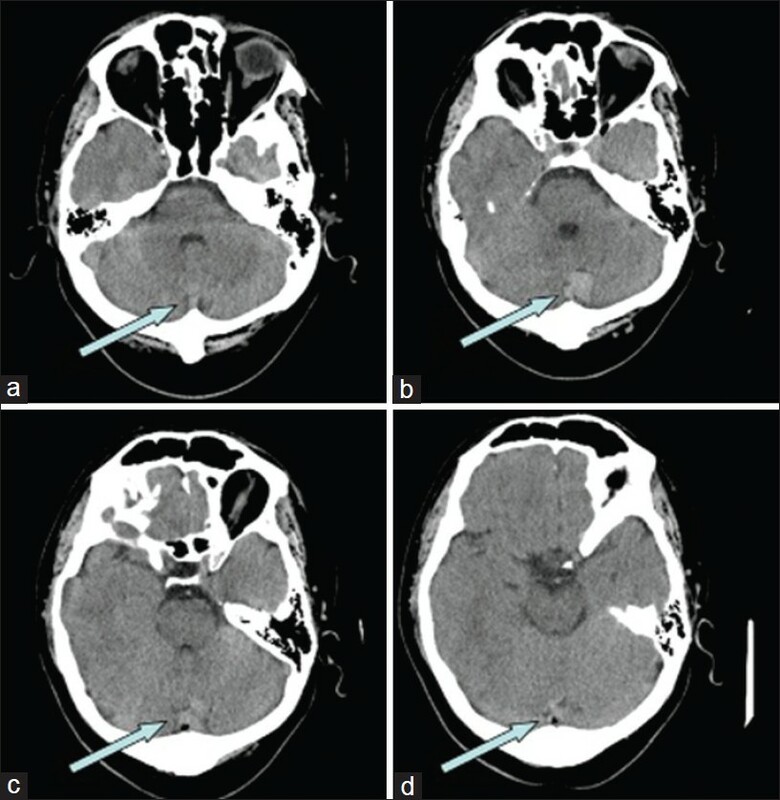 CT in 3 patients revealed cerebellar infarctions but without any neurological deficits. None of the 14 patients had rebleeding or fresh neurologic deficits during the follow-up period. 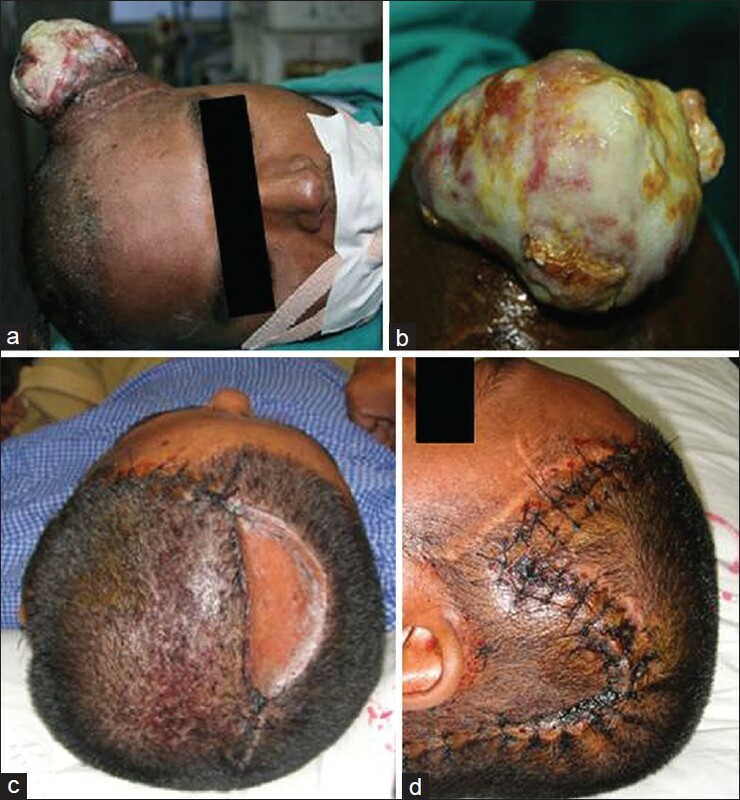 Aneurysmal recanalization had not been observed in any of the survived patients. Conclusions: Onyx occlusion of proximal parent artery and aneurysm in the treatment of distal PICA aneurysm is safe and effective according to this study. Morphology and location of aneurysm are important to decide the therapeutic strategy. Objective: The aim of the study was to compare the perioperative complications, obliteration rates, discharge dispositions, clinic-radiological outcomes, and the role of calcification between the microsurgical and endovascular treatment of unruptured intracranial aneurysms. 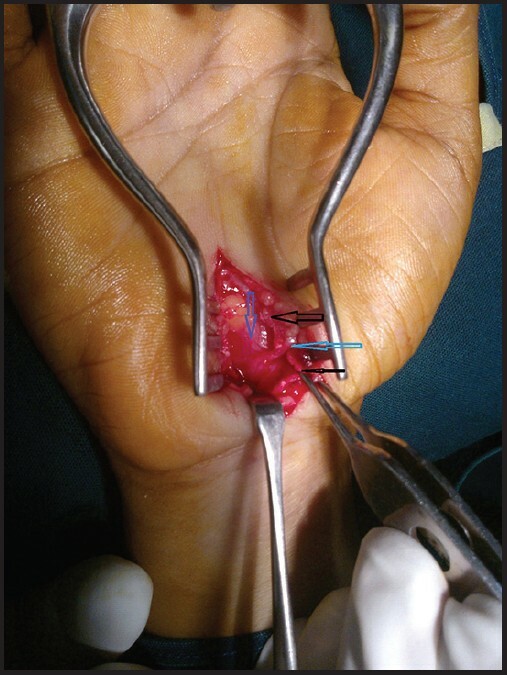 Materials and Methods: Retrospective data of the patients treated with microsurgical clipping and those treated by endovascular coiling from January 2007 to August 2012 was collected from the database. Results: Intraoperative rupture was not different in both the treatment groups (4.05% vs. 1.5% clip vs. coil). A total of 9.4% of the patients in the clipping group and 4.5% of the patients in the coiling group suffered postoperative stroke. At last follow up, 89% of the patients in the clipping group and 93% of the patients in the coiling group had favorable outcomes. The mean length of stay was more in clipping group (6.1 vs. 2.7, clip vs. coil, P < 0.05). Patients discharged to home without assistance/rehabilitation services were more in coiling ( P = 0.001). A total of 28.4% (23/81) of the coiled aneurysms were found to have residue neck on postoperative angiograms as compared with 12.6% (10/79) of the clipped aneurysms ( P = 0.01). 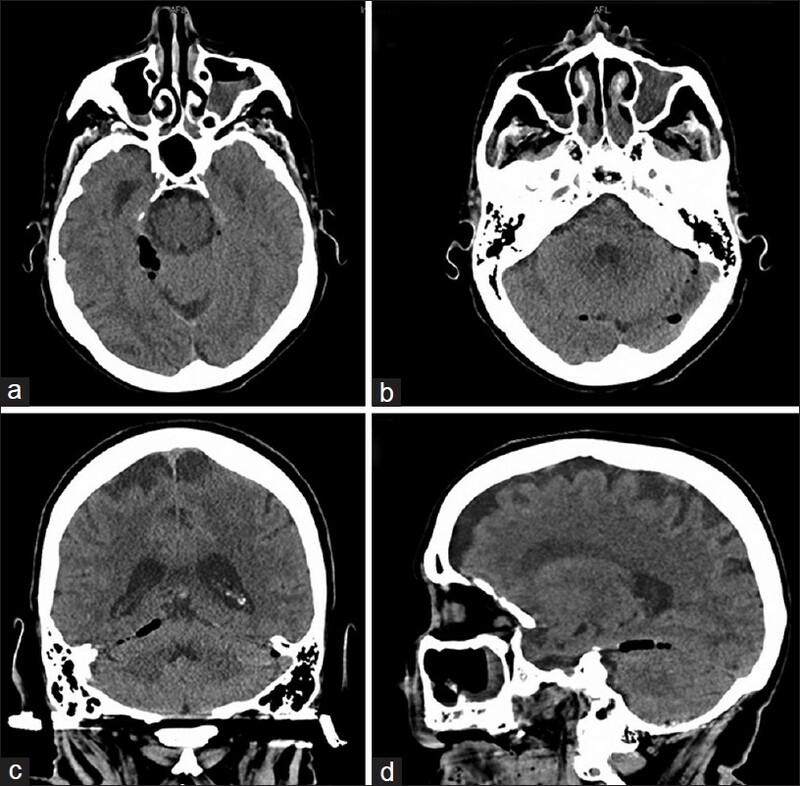 Calcification within the aneurysm was strongly correlated to the size, perioperative complications, and the outcome ( P < 0.05). However, on excluding the calcified cases the size and outcome do not show a significant correlation. Conclusion: With appropriate patient selection, the majority of the UIAs can be managed by either of the treatment modalities with very low mortality and morbidity. Both the treatment modalities should be employed synergistically. Purpose: To assess the setup errors and intrafraction motion in patients treated with frame-based and frameless stereotactic radiosurgery (SRS). 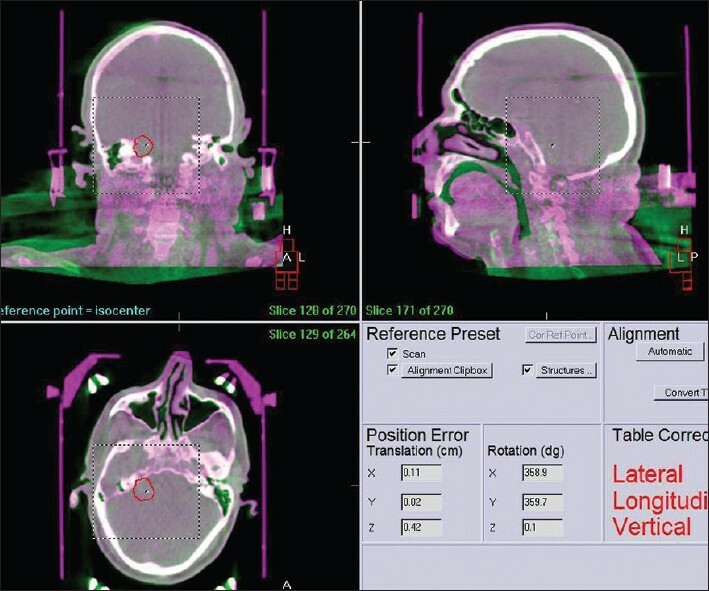 Materials and Methods: Ten patients treated with frame-based and six patients treated with frameless radiosurgery were prospectively enrolled in the study. Leksell frame was used for frame-based and a customized uniframe orfit cast for frameless techniques. Cone beam computed tomography (CBCT) scans were taken immediately before and after each treatment to evaluate the positional accuracy and corrections applied with the use of hexapod couch for both groups. Results: The mean translational shifts with frame-based SRS were 1.00 ± 0.30 mm in the lateral direction (X), 0.20 ± 1.20 mm in craniocaudal direction (Y) and -0.10 ± 0.31 mm in the anteroposterior direction (Z). The rotational shifts for frame-based treatments were as follows: roll 0.32 ± 0.70, pitch 0.44 ± 0.66 and yaw 0.20 ± 0.4. For frameless SRS, translational shifts were -0.40 ± 0.90, 1.10 ± 1.10, and 0.50 ± 1.30 mm in X, Y, and Z directions, respectively, and rotational shifts were -0.11 ± 0.78, 0.20 ± 0.44, and 0.29 ± 0.35 in roll, pitch, and yaw, respectively. Intrafraction shifts with frame-based SRS were: X = 0.60 ± 1.80 mm, Y = 0.20 ± 0.60 mm, and Z = 0.00 ± 0.05 mm; and rotational shifts were: roll 0.01 ± 0.27, pitch 0.06 ± 0.15, and yaw 0.01 ± 0.09. For frameless SRS, these were: X = 0.11 ± 0.20 mm, Y = 0.20 ± 0.40 mm, and Z = 0.20 ± 0.20 mm and rotational shifts were: roll 0.09 ± 0.23, pitch 0.00 ± 0.12, and yaw 0.00 ± 0.09. Conclusions: In our experience, set up accuracy of frameless SRS is as good as frame-based SRS. 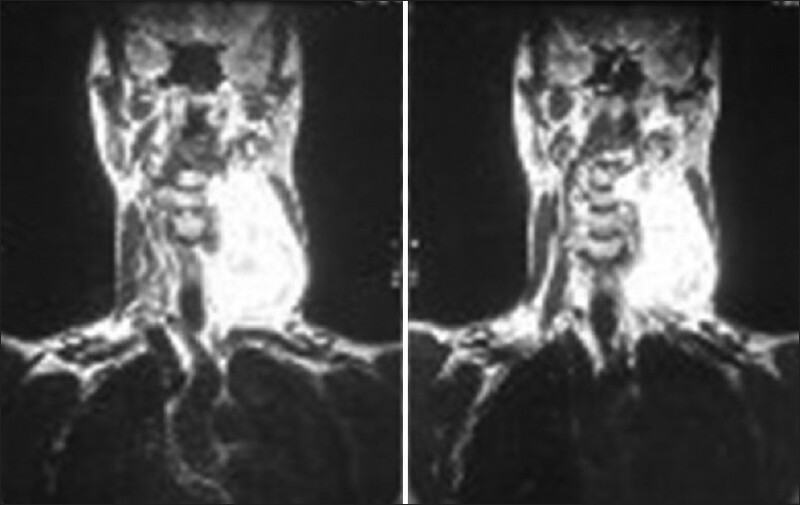 With availability of verification methods such as CBCT and hexapod couch, an accurate and precise treatment delivery is feasible with frameless techniques. Aim: To evaluate the use of a biodegradable nanofiber-covered stent (BDNCS) in the treatment of a canine carotid artery aneurysm. Materials and Methods: Seventeen beagle dogs, each with one lateral saccular aneurysm created using a venous pouch, were selected to test the BDNCS. The BDNCS consists of three parts: A bare stent, a biodegradable nanofiber membrane, and a balloon catheter. 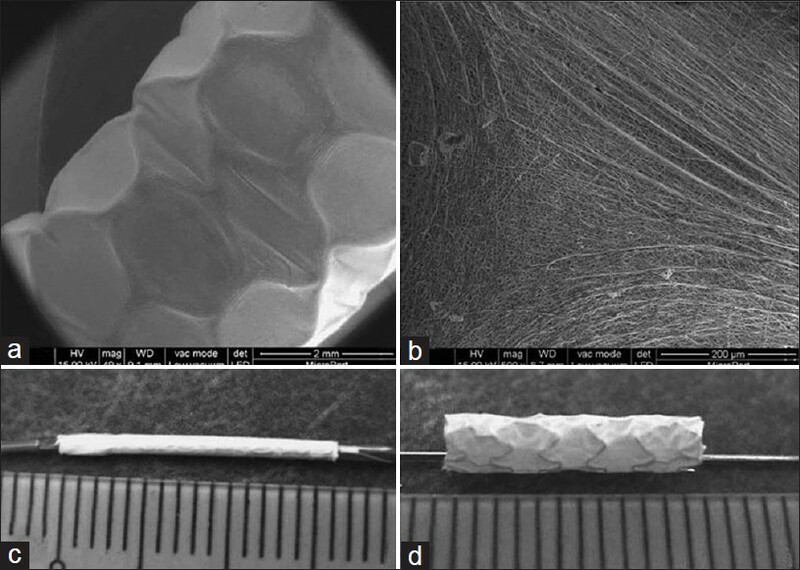 The bare stent was sculpted by a laser from a cobalt chromium superalloy, and the biodegradable nanofiber membrane was constructed from polylactic acid (PLA) and polycaprolactone [PCL, P (LLA-CL)] by the electro-spinning method. The biodegradable nanofiber stent was premounted on a balloon catheter to form a BDNCS. Angiographic assessments were categorized as complete or incomplete occlusion. Data regarding technical success, initial and final angiographic results, mortality and morbidity were collected, and follow-up was performed at 1 and 3 months after the procedure. Results: BDNCS placement was successful in 17 canines with 17 aneurysms. The initial angiographies showed that a complete occlusion was achieved in 13 canines (76.5%) and an incomplete occlusion in 4 (23.5%). One canine died 1 week later. The angiographies obtained at 3-month follow-up exhibited complete occlusion in 14 canines (87.5%) and an incomplete occlusion in 2 canines, with mild in-stent stenosis in 5 canines. Conclusions: Our results suggest that BDNCS may be a feasible approach for aneurysm occlusion, although the occurrence of mild in-stent stenosis was relatively high. Longer-term follow-up investigations are needed to validate these findings. 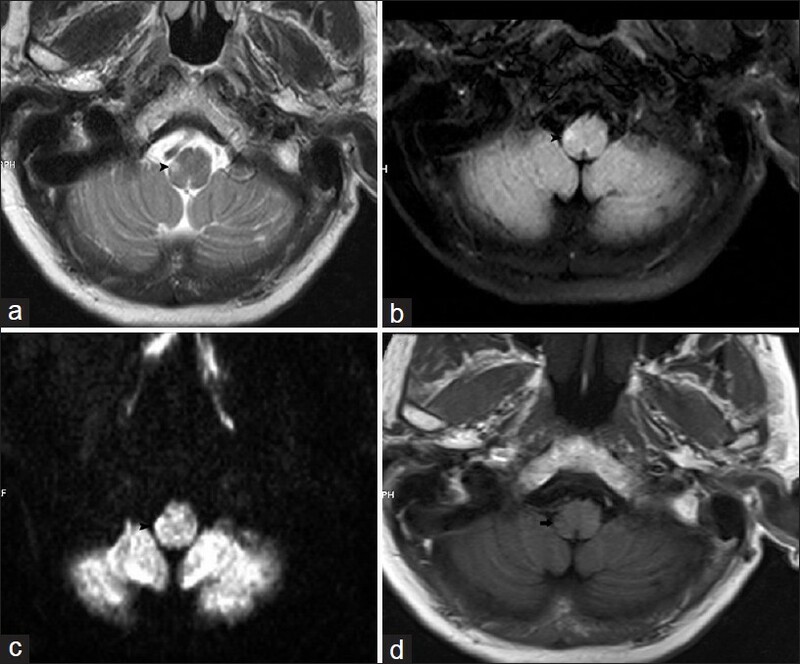 Background: Cerebral cavernous malformation (CCM) is frequently associated with intractable focal epilepsy. Epileptogenicity is usually attributed to the hemosiderin deposits. Extent of resection is a crucial issue for achieving good seizure outcome. Aim: To assess whether seizure outcome is related to the extended resection (ER) of surrounding hemosiderin fringe brain tissue. 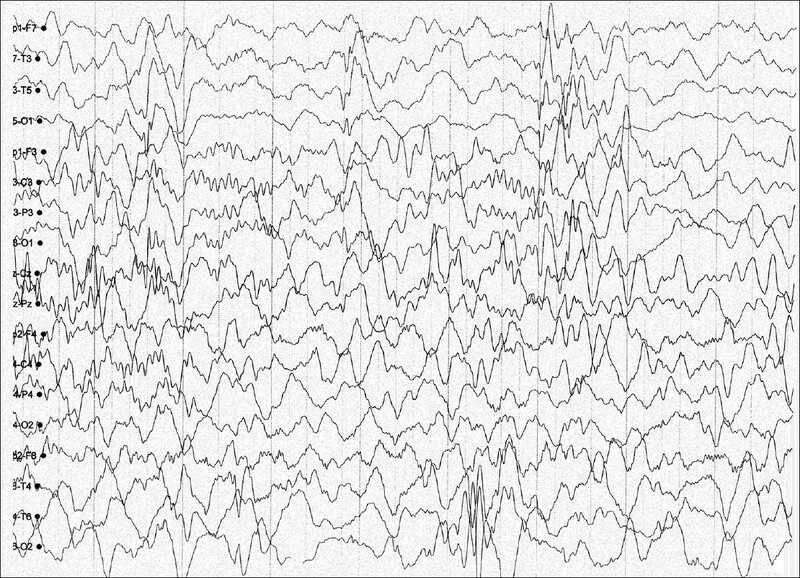 Materials and Methods: Between April 2000 and April 2008, 132 patients with CCM and refractory epilepsy were scheduled for surgery based on the high-resolution magnetic resonance imaging (MRI) findings and intensive video-electroencephalogram (EEG) monitoring. All patients underwent pre- and post-operative MRI. Based on MRI findings patients were grouped into: ER group (ER, hemosiderin completely removed) and lesionectomy group (LE, hemosiderin not/partially removed). Post-operative seizure outcome was compared between the two groups based on Engel and the International League Against Epilepsy outcome scales. Results: At 1-year follow-up of the 86 patients in the ER group, 54 (74.4%) achieved seizure free outcome and in the LE group of the 46 patients, 20 (59.5%) achieved seizure-free outcome. At 5-year follow-up, 59.5% (25/42) of patients in ER group and 27.8% (5/18) of patients in LE group achieved seizure-free outcome. ER was not associated with increased neurological morbidity. Conclusions: Our study suggests that complete removal of hemosiderin fringe brain tissue surrounding CCMs may improve short-term and long-term seizure outcome. 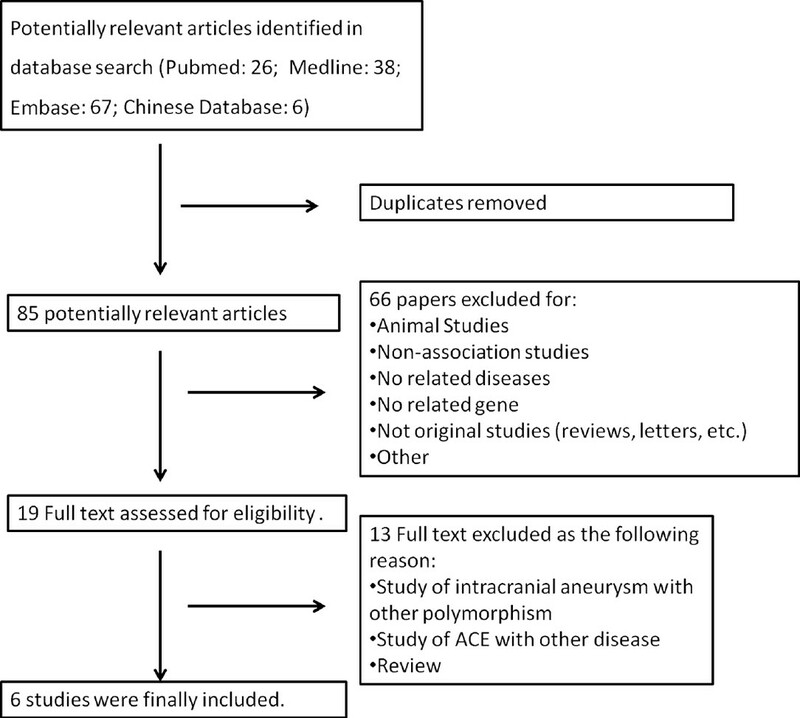 Context: Previous studies investigating the association between angiotensin converting enzyme (ACE) insertion (I)/deletion (D) polymorphism and intracranial aneurysm (IA) have provided inconsistent results and no large systematic review or meta-analyses have been conducted regarding this issue. Aim: To confirm whether the ACE I/D polymorphism correlates with risk of IA. Settings and Design: We conducted a meta-analysis to increase the statistical power by using all the available published data. Materials and Methods: Two investigators independently searched the PubMed, Medline, Embase, China National Knowledge Infrastructure and Chinese Biomedicine Databases for studies published before December 2012. For included studies, we performed meta-analyses using the Cochrane RevMan software. Statistical Analysis: Summary odds ratios (ORs) and 95% confidence intervals (CIs) for ACE I/D polymorphisms and IA were calculated in a fixed-effects model or a random-effects model when appropriate. We used Cochran's Q statistic and the I 2 statistic to assess heterogeneity and funnel plot to assess potential publication bias. We also carried out stratified analyses and sensitivity analyses by ethnicity, country and source of control group, sample size and Hardy-Weinberg equilibrium (HWE) in controls. Results: Six eligible studies were reviewed and analyzed, involving 854 cases and 1280 controls. Overall, compared with D allele, there was a close relationship between I allele and IA risk (OR: 1.21, 95% CI: 1.07-1.37, P = 0.003; Pheterogeneity = 0.56; I² = 0%). ACE I+ (I/I and I/D) genotype had significantly increased risk for IA (OR: 1.27, 95% CI: 1.03-1.57, P = 0.03; Pheterogeneity = 0.14; I² = 40%). This association remained consistently strong when analyses were limited to studies, in which genotype frequencies were in HWE. No publication bias was found in the present study. Conclusions: Our meta-analysis suggests, there is a close relationship between ACE I/D polymorphism and IA risk. Since limited studies and subjects were included, it is critical that larger and especially well-designed multicentric studies, which based on interactions of ACE and different confounding factors should be performed to re-evaluate the association. We have described the occurrence of Morvan syndrome (MoS) after scrotal tap and injection of sclerosing agent for the treatment of hydrocele in 5 male. The mean age was 43.2 years, and the gap between the procedure and development of clinical features suggestive of MoS was 1.5-3 months. The neurophysiology studies demonstrated hyper excitability of peripheral nerves. In addition, autonomic dysfunction, severe insomnia, and neuropsychiatric features were observed. Significant VGKC-complex/CASPR-2 antibodies titer were present in all cases. Symptoms resolved spontaneously within 6 months of onset. 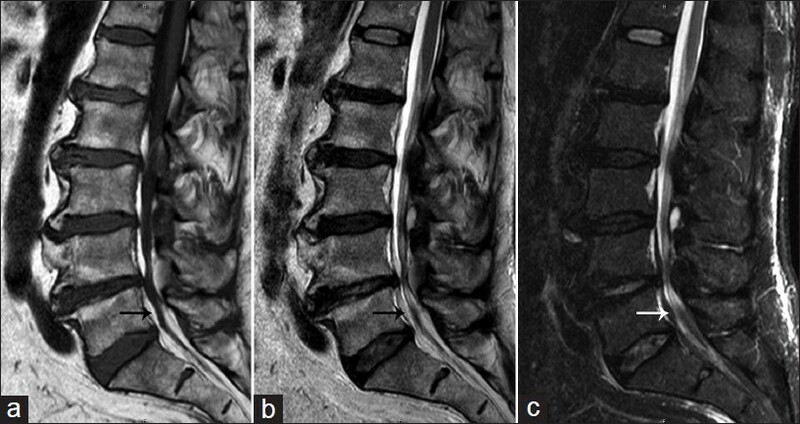 Ependymomas are common in intramedullary location and extradural location of the spinal cord is very rare. A few cases in the lumbosacral region have been reported. 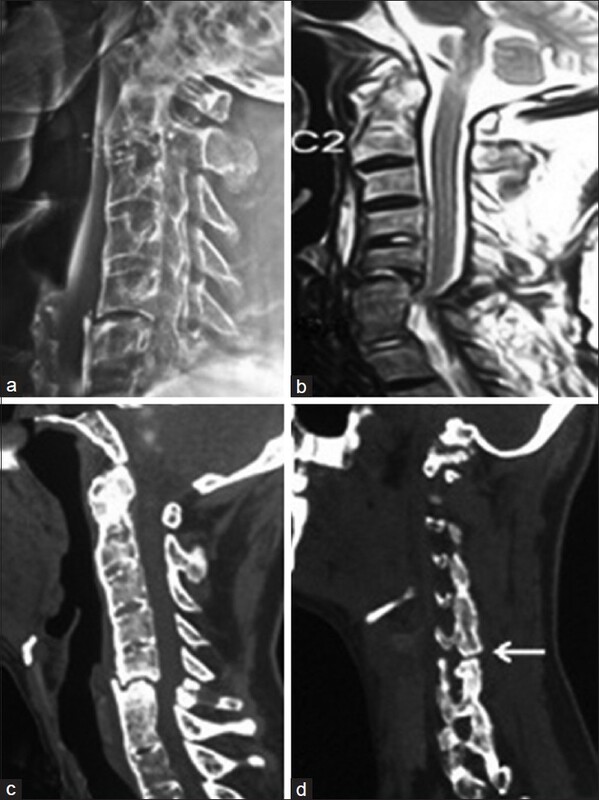 This report presents a cervical dumb-bell ependymoma with a small intraspinal extradural component and a large extraspinal component in the posterior triangle of the neck. The tumor was excised in two stages. 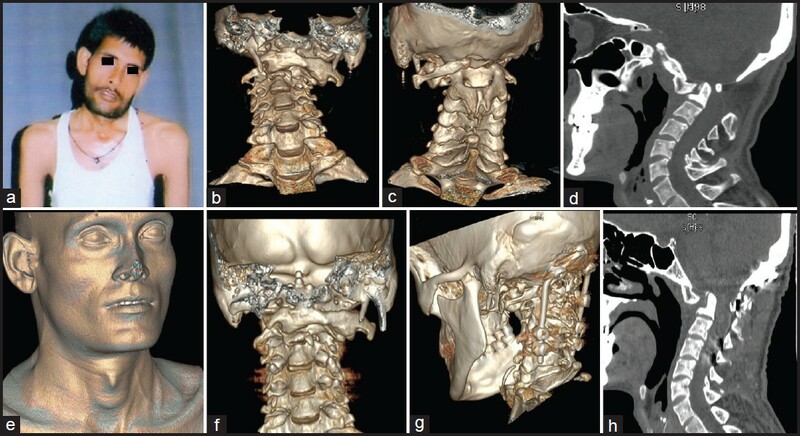 This is probably the first such case report in the cervical region in the world literature. 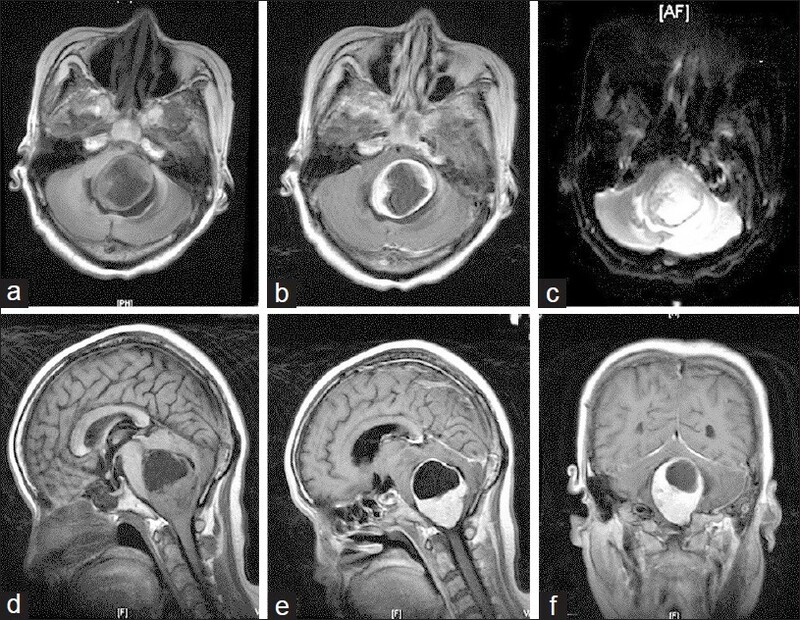 Possible histogenesis of ependymoma in this location is also discussed.